First Marblehead Corporation was a speciality finance company that specialized in providing private lending solutions to students in the United States. The company was founded and lead by Dan Meyers in 1991. After going private in August 2016, First Marblehead Corporation changed their name to Cognition Financial Corporation in May 2017. 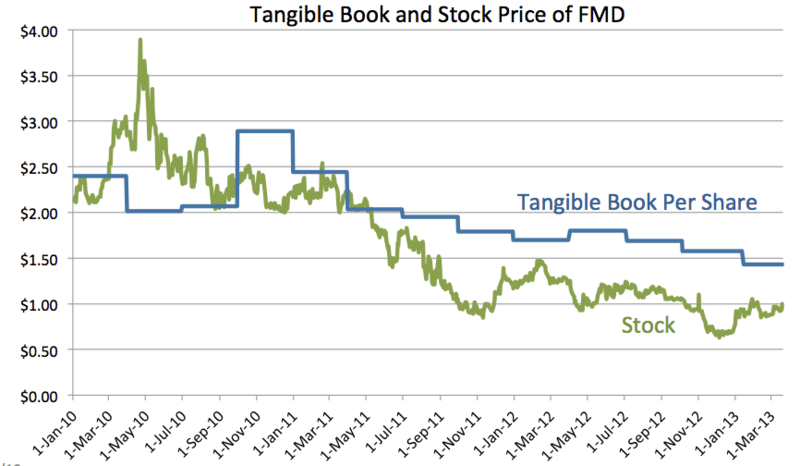 First Marblehead (FMD) is a very misunderstood company that currently trades at $1.45 or about 70% of cash liquidation value. It comes with a large embedded call option as the returning founder Dan Meyers rebuilds the business. I call it a smoldering cash pile with an unknown quantity of (free!) dynamite underneath. The reason it is so cheap and misunderstood is because of tarnished recent history with investors and unusually strict recent GAAP accounting rules. The private student loan market and their previous business model of securitization were put on ice in 2007 with the financial crisis and have only recently begun to thaw. Their GAAP financials also completely obscure the fact that they trade below cash liquidation value as excessively strict trust-consolidation rules (think Citi’s SPV abuse…) confuse what shareholders own and do not own. The stock has also dropped quite rapidly in the last month on high volume with no news. This is possibly due to a forced liquidation but who knows, I like to buy when Mr. Market is headed for the door in a hurry. Distress is downside. But as for the US, the biggest thing that I worry about for the longer term is our educational system. As we become more and more of a high technology society, our population needs more and better education. It is not getting it. More than 37% of our working age population doesn’t have anything more than a high school degree. Georgetown University just issued a study saying that by 2018, 44% of jobs in this country will require more than a high school degree. The overhaul by Sallie Mae is playing out as college students, facing persistent unemployment and a sluggish economy, are defaulting on their loan payments at a rate of 13.4 percent, a level not seen for more than a decade, according to the latest statistics from the Department of Education. As student loan debt grows — it has outpaced total credit card debt, reaching more than $1 trillion — more loans are going to the riskiest borrowers, according to a January report by TransUnion Corporation, which provides credit information to lenders. The $118 billion in FFELP loans is where Sallie Mae currently derives the bulk of its money. FFELP loans, which are backed by the government (more on that later), accounted for 76% of the company’s $1.3 billion in revenue derived from servicing loans. Put simply, FFELP loans are a big business for Sallie Mae. But that’s changing because back in 2010 U.S. government decided to put an end to the FFEL program through the Health Care and Education Reconciliation Act of 2010. Instead of guaranteeing the loans Sallie Mae made to students the government decided to make the loans to students directly through its own Direct Loan program. That means a once booming area of revenue for Sallie Mae is going to start shrinking. In 2012, servicing revenue decreased by $24 million primarily due to the end of FFELP in 2010. The company says its FFELP portfolio will amortize over 20 years. But while that area is shrinking another area of business is growing for Sallie Mae. It’s private loan origination business which is where students and their parents go to borrow money when financial aid and federal loans aren’t enough to cover the cost of college. Right now, Sallie Mae Bank, which originates those private loans has about $9.9 billion in assets and that’s expected to grow to hit $10 billion this year. Student loan origination went from $2.3 billion in 2010 to an estimated $4 billion at the end of this year. Its market share of the private student loan period will rise to over 50% from 32% in the same period. In fact, Sallie Mae says the government’s new federal loan program [DSLP], which replaced FFELP, pose a “significant threat” to its own private loans. “If loan limits under the DSLP increase, DSLP loans could be more widely available to students and their families and DSLP loans could increase, resulting in further decreases in the size of the Private Education Loan market and demand for our Private Education Loan products,” the company notes. “The Bennett hypothesis states that this happens basically whenever the government subsidizes higher ed. Every $1 increase in subsidies is matched by a $1 increase in price. The money is pocketed by the university, not the students. The economist Albert Hirschman once categorized this type of conservative argument as the “argument from perversity,” that a proposed policy change will actually have the opposite effect of its intended one. But in this case at least, there’s a ring of plausibility to it.